» Where Do Flying Squirrels Live? 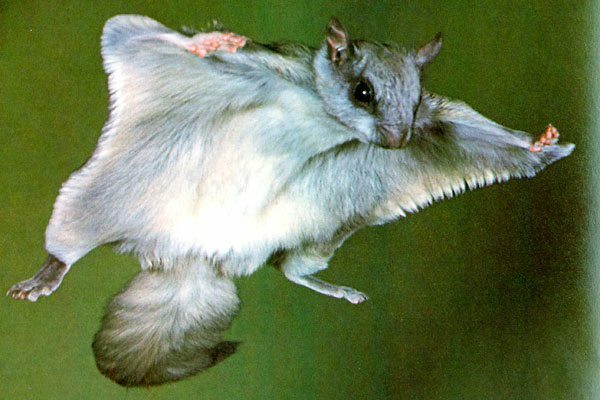 Flying squirrel is a term that refers to two species – northern and southern flying squirrels. These two little guys have their specific characteristics and habitats that they live in. So without further ado, here’s everything that you need to know about flying squirrels and the places that these can be found. Where do Northern Flying Squirrels Live? The northern flying squirrel has brown fur on its back and grey fur on its belly. It has a fleshy membrane – the one that enables the squirrel to “fly.” This squirrel is also characterized by an incredibly long tail (the tail usually has the same length as 80 percent of the squirrel’s body). Another defining characteristic is the large eyes of the squirrel. They play an important role for nighttime vision because the animal is active during the dark hours, as well. There are no differences between the male and the female northern flying squirrels. Northern flying squirrels inhabit a large area from Alaska in the north to California in the south. These squirrels can also be found in Tennessee and North Carolina. Some smaller populations can also be found in the mountain areas of the US. These squirrels need a coniferous or a deciduous forest to thrive. They typically have their dens high in coniferous trees. Such squirrels usually live in dens or nests made of twigs and bark. Feathers and leaves can be used to make the inside of the nest softer and a little bit more comfortable. Where do Southern Flying Squirrels Live? Southern flying squirrels look quite a lot like their northern counterparts but there are a few important differences. The southern flying squirrel is usually smaller and the fur on its belly is white rather than grey. Just like the northern flying squirrel, it has a fleshy membrane that’s used during the process of flying from one tree to another. Another major difference can be observed in the squirrel’s tail. It’s not fluffy and long but rather flat. The length of the tail is once again impressive. There are no significant differences between the male and the female representatives of the species. Southern flying squirrels can be found mainly in the south parts of Canada and the eastern part of the US. Some populations inhabit the mountain regions of Mexico and Honduras. The squirrels are found in forests that are made of seed-producing trees. Maple, beech, poplar and oak forests are the ones typically inhabited by these squirrels. Once again, the squirrels make their nests high in the trees. The southern flying squirrels use the same materials as the northern ones to construct the nest and to make its interior comfy. Apart from these two popular species, there are several other kinds of flying squirrels. Siberian flying squirrels can be seen in the northern parts of Europe and in Asia. Most of the populations are concentrated in Siberia and Mongolia. Finland, Latvia and Estonia have their populations, as well. In many parts of Europe, the Siberian flying squirrel is an endangered species. Habitat destruction in Siberia is one of the main reasons why the population of this incredibly cute animal is decreasing. Siberian flying squirrels have some characteristics that make them similar to the northern species from Canada and the US. They have large eyes, mainly because of the fact that they are nocturnal animals. The squirrels are tiny – their weight is only five ounces. Once again, the squirrel has a very long tail and it has a grey to silver-colored fur. These squirrels love older, well-established forests that have high trees. Most often, they can be found in mixed forests. The squirrels are active in the evening and during the night. They spend most of the day hidden in their nests. Rain forest flying squirrels (like the red giant flying squirrel) and San Bernardino flying squirrels are other popular species. Unfortunately, the final one mentioned in this article is an endangered species. In the past, the squirrel used to be found throughout California’s San Jacinto Mountains. Today, a small population is concentrated in just one area. Drought and the global warming have led to a habitat change – the main reason why the San Bernardino flying squirrels have experienced such a sharp population decline.